Apart from 3, this screening was very disorienting. In 2, there is a footage of aircraft carrier Hornet attacked by Japanese, followed by send-off rally of young soldiers. And “There was a Father”. It was like sitting in the movie theater in 1943 Japan. The history of this particular print is here. Finally I had an opportunity to see this print. (1) No, audio is no better. I heard that this print has a better audio track (it says so on NFC website). No. Surely, there are some parts of the film which has definitely better audio than the previous MOMAT-NFC print, but in general, the sound quality is not as good. Recent DVD release cleared up the audio noise considerably. There are too many cuts, frames missing, jumps and more jumps. It completely destroyed the narratives and the pace of the film. Supreme Commander of the Allied Powers (SCAP), the Occupation Forces in Japan after the War, surveyed the large part of prewar/wartime Japanese films, and did cuts on any military, feudal, racial reference in them. The MOMAT-NFC print was the one subjected to this process, and many lines and scenes were cut and destroyed. These deleted scenes survived in this print. Especially, you will find many scenes during the reunion never seen before. Kurokawa (Shin Saburi) reports that three members of the class had been drafted and sent to war zone. After that, Hirata (Takeshi Sakamoto) adds that Horikawa’s son has passed the medical examination and soon to be drafted. This sets the slightly different tone in the following sequence. There is a big climax during the reunion, a couple of minutes in length, which was cut by SCAP. Horikawa (Chishu Ryu) was begged by all to recite the poetry. The scene ends abruptly at this point in MOMAT-NFC print. The Gosfilmofond print contains the whole poetry reading (this is called “Shigin“, a form of poetry chanting). The reason for the cut was the poetry. It is “Seiki no Uta” by Commander Takeo Hirose, a Troop God. It is the poetry celebrating sacrifice for the big cause, for the emperor. Soseki Natsume, one of the most prominent Japanese novelist during Meiji/Taisho era, called this poetry “the extreme of the mediocre” and went on to say “we wish he (Commander Hirose) had died on that ship quietly without making this poetry”. Natsume must have feared that this could be exploited by military and other reactionary groups to promote their causes. His fear has materialized in this film. This is a rather long scene. During the reading/chanting, all the former students quietly listen. The camera captures their quiet attentiveness from the lowest position possible. Even the waitress quietly sits on tatami in the next room and listens. Then, suddenly, all the students look up. Hirata is weeping. He says “Old age does this, don’t mind me, continue”. Horikawa continues. And cut. Abrupt ending of the MOMAT-NFC print suggested there must have been a footage at the ending of the film. This print, even though incomplete, tells us what it was. It was the song “Umi Yukaba” by Kiyoshi Nobutoki. (Wikipedia English says this song was popular during and after the war. This song was very popular during the war but “sealed” after the war.) Follow the link and read the lyrics. You know why it was cut. Even in this print, the song can be heard only for a few seconds. 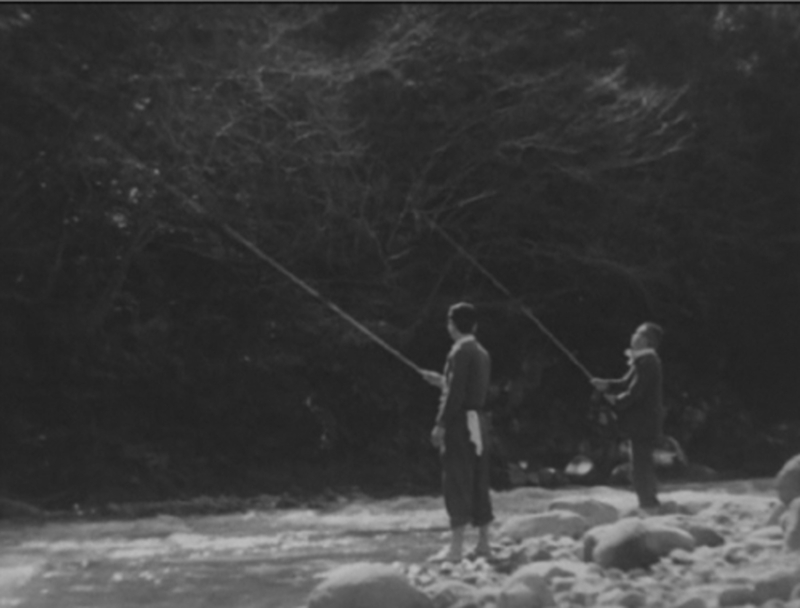 Overall, this print alone is not suited for Ozu appreciation. The print has too many jumps. which destroyed the atmosphere of the film. The restoration of two prints is necessary for us to appreciate the film in full. As controversial as it may be, we would have to reassess it as an art in this particular time in history.